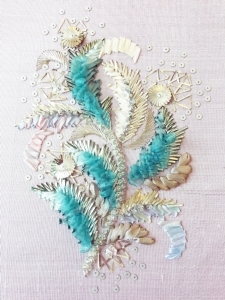 Metal plate and silk ribbons have been used in Haute Couture Embroidery in France for many years and are used to embellish couture garments and home interiors in various ways. This type of embroidery adds a more geometric quality to any embroidery work. In this 1 day class you will learn to handle and stitch silk ribbons and metal plate ribbon in interesting ways, overlapping & interlocking and creating dimension. These complimentary materials are a delight to work with and add a spectacular dimension to your embroidery. You will learn how to prepare your fabric on an embroidery frame, transfer a design and finish your piece with beads.